The Shaked Committee reaches a compromise on hareidi draft-dodgers. The Shaked Committee has reached a compromise on the sanctions to be given to hareidi draft-dodgers, Ma'ariv reports Tuesday. According to the new compromise, the sanctions against draft-dodgers will be criminal, not economic - but only for a six-month period after the Equal Burden of Service bill becomes law. If the hareidi community does not meet the draft quota during a shorter transition period after the law is enacted, the six-month waiting period will take effect; the waiting period will, in turn, give lawmakers time to gauge the effectiveness of the law and whether or not there are other ways to solve the draft problem. According to the framework reached within the Quartet of the Shaked Committee - which consists of Chairman Ayelet Shaked (Jewish Home), MK Ofir Shelah (Yesh Atid), MK Elazar Stern (HaTnua), and MK Amar Bar-Lev (Labor) - the compromise is meant to bridge the gap between Yesh Atid, which has been demanding criminal sanctions, and Jewish Home, which has been pushing for economic sanctions. The compromise, as drafted by Bar-Lev, sees both needs being met. On the one hand, the hareidi community has been given a shorter interim period to respond to the draft notice; on the other hand, the waiting period allows for the implementation of economic sanctions to return to the committee agenda. According to a "senior source," several members of the committee are still pushing for economic sanctions to be enacted, as a preliminary measure before the criminal sanctions take effect; however, the likelihood of the proposal being accepted is minimal. It is still unclear when the vote on the compromise, as well as on the law in general, is due to take place, according to the daily. However, there is speculation that voting on the various terms could begin as early as Wednesday and be done by the end of next week. Tuesday's announcement surfaces amid concerns that the prospect of criminal sanctions have already alienated the hareidi community even more from the idea of a draft, after the Shas party quit the Shaked Committee over the move. 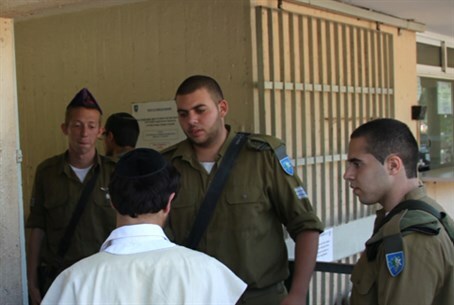 Hareidi leaders have expressed strong opposition to criminal sanctions for yeshiva students, and some pro-enlistment leaders have warned that strong sanctions could create a backlash that would mean fewer hareidi men in the army, not more. While the ruling was thought to be meaningless, given that February's yeshiva funds had already been allocated, Finance Minister Yair Lapid took advantage of a loophole to retroactively cancel funding to all yeshivas earlier this month, sparking massive hareidi protests.